The soaring U.S. dollar is squeezing companies in emerging markets from Brazil to Thailand that now face higher costs on roughly $1 trillion in bonds sold to investors before the greenback’s surge. 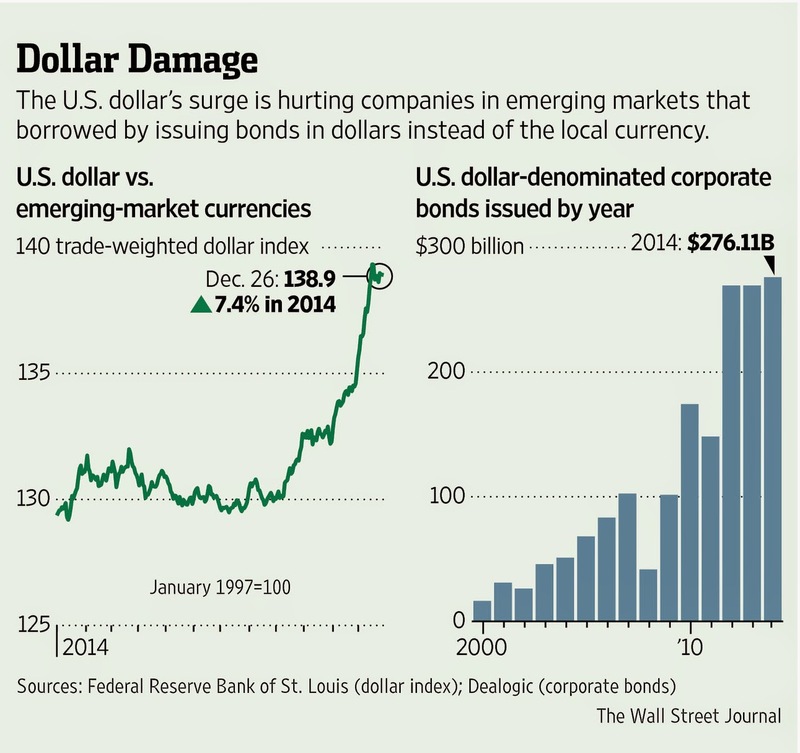 For 2014, the dollar is on track to gain more than 7% compared with a group of emerging-market currencies tracked by the Federal Reserve Bank of St. Louis As the rise ripples through economies around the world, it is causing particular pain at firms in emerging markets that issued bonds in dollars instead of local currency. The dollar’s rise means it costs more to make regular bond payments and pay off outstanding bonds as they mature. That is starting to hurt earnings at many companies, will likely force some to dip into emergency reserves and could trigger defaults on some corporate bonds, analysts warn. To some economists, the mounting pressure evokes memories of currency crises in Asia and Latin America during the 1980s and 1990s, when the strong U.S. dollar helped trigger slides in economic growth and prices for real estate, commodities and other assets. “The investor community is becoming very much one-way or crowded toward retrenching to the U.S.,” says Nikolaos Panigirtzoglou, global markets strategist at J.P. Morgan Chase & Co. Many of the same countries are vulnerable again now, but few analysts and investors foresee a full-blown crisis. More than two-thirds of the outstanding corporate bonds in emerging markets are considered high-quality by major rating firms, meaning they carry a low default risk. Meanwhile, some companies have been trying to shield themselves from possible harm by issuing at least some bonds in their home country’s currency. “I don’t think it’s a systemic issue,” says Samy Muaddi, a portfolio manager at mutual-fund giant T. Rowe Price Group Inc. In 2014, companies in emerging markets issued a record-high $276 billion of dollar-denominated bonds as of Tuesday, according to Dealogic. Such sales soared after the financial crisis as borrowers took advantage of rock-bottom interest rates set by the Federal Reserve and other central banks. Countries also have flocked to dollar-denominated bonds, saddling those governments with higher debt-service costs as the dollar rises. Analysts say many countries generally are in a stronger position to withstand the dollar’s pain because their reserves are larger than in previous crises. Overall, companies and sovereign-debt issuers have $6.04 trillion in outstanding bonds, up nearly fourfold since the 2008 financial crisis, according to Dealogic, a financial-data provider. Fourth-quarter results due in January from companies throughout the world will begin to show how much the soaring U.S. dollar is hurting companies in emerging markets. Earnings at many companies in Latin America will likely be hit, says Eduardo Uribe, who oversees corporate-debt assessments there for bond-rating firm Standard & Poor’s Ratings Services, a unit of McGraw Hill Financial Inc. Many emerging markets also are being pummeled by falling prices for commodities such as oil and slower economic growth. Bond markets in emerging-market countries recently suffered one of their worst selloffs since the financial crisis, based on a Barclays PLC index of emerging-market debt in dollars. The Indonesian rupiah, Chilean peso, Brazilian real and Turkish lira are near multiyear lows. Mexico’s central bank bought pesos earlier this month to keep the depreciating currency from pushing the economy into a funk. More pressure will come if the Fed raises interest rates next year for the first time since 2006. Luca Paolini, chief strategist at Pictet Asset Management, says the firm reduced its exposure to emerging-market corporate bonds a few months ago on concerns about a potential slide. “There may be a lot more volatility next year, and we can’t rule out some credit event that can generate a lot of panic,” he says. Fears are swirling about Russia, where the ruble has swung sharply as the economy struggles under the weight of Western sanctions and lower oil prices. Lubomir Mitov, chief European economist at the Institute of International Finance, a banking trade group, forecasts “a widespread wave of corporate defaults” in Russia next year. As investors shift from currencies, stocks and bonds in emerging markets to dollars, the move threatens to depreciate local currencies even more. The stronger dollar also pushes the cost of new borrowing higher. Prices for bonds issued by Russia’s OAO TMK, one of the world’s largest pipe makers, that are due in 2018 are down by more than 30% since late October. Bond prices move in the opposite direction from borrowing costs. In the U.S., the stronger dollar hurts exporters by increasing their production costs compared with foreign rivals and shrinking their non-U.S. profits when converted into dollars. The dollar’s rise makes imports more attractive to American consumers. Top officials at the International Monetary Fund and the Bank for International Settlements, two of the world’s leading financial institutions, have warned that the exchange-rate turmoil could lead to corporate defaults and asset-price busts around the globe. Some analysts expect the IMF to lower its five-year growth forecast for emerging markets. Brazilian sugar producer Virgolino de Oliveira SA is struggling with its debts as sugar prices fall. Ratings firm Fitch Ratings, a unit of Hearst Corp. and Fimalac SA, warned this month that the Brazilian company will likely default in the coming months on debt that includes dollar-denominated notes. The company didn’t respond to requests for comment. Malaysia’s state-run oil and gas company, Petroliam Nasional Bhd., or Petronas, said in its third-quarter results that the dollar’s rise against the ringgit was partly to blame for lower quarterly revenues. About 70% of the company’s debt is in U.S. dollars, and its bond yields spiked as the ringgit fell nearly 9% in the past six months. The financial hit was bad for Malaysia’s government, which collects major revenue from oil and gas sales. Shweta Singh, a senior economist at research firm Lombard Street Research, expects the dollar to keep climbing as the U.S. economy strengthens and emerging markets keep struggling to rev up economic growth. As a result, “the debt burdens of emerging markets will intensify,” she says. If problems deepen, they could bruise investors who poured money into emerging markets and are still holding on to those investments. The bond-sale boom was fueled by investors who roamed the world seeking higher returns after the financial crisis, including from dollar-denominated bonds. But overall investments in emerging markets by outsiders have grown so huge that it would be hard during a jolt for investors to sell without pushing those markets sharply lower, many analysts say. —Nicole Hong contributed to this article. I was raised on a farm and I’ve shoveled more than my share of manure. I didn’t like manure back then, and I like the brand of manure that comes out of Washington, DC, and Wall Street even less. A stinky pile of economic manure came out of Washington, DC, last week and instead of the economic nirvana that it was touted to be, it was a smokescreen of half-truths and financial prestidigitation. According to the newest version of the Bureau of Economic Analysis (BEA), the US economy is smoking hot. The BEA reported that GDP grew at an astonishing 5.0% annualized rate in the third quarter. Moreover, this is the second revision to the third quarter GDP—1.1 percentage points higher than the first revision—and the strongest rate since the third quarter of 2003. However, that 5% growth rate isn’t as impressive if you peek below the headline number. Fun with Numbers #1: The biggest improvement was in the Net Exports category, which increased by 112 basis points. How did they manage that? There was a downturn in Imports. Fun with Numbers #2: Of the 5% GDP growth, 0.80% was from government spending, most of which was on national defense. I’m a big believer in a strong national defense, but building bombs, tanks, and jet fighters is not as productive to our economy as bridges, roads, and schools. Of that 100 bps, the two largest categories were Healthcare spending (52 bps) and Financial Services/Insurance (35 bps). The end result is that 85% of the contribution to GDP from Household Spending on Services came from healthcare and insurance! In short… those are code words for Obamacare! While the experts on Pennsylvania Avenue and Wall Street were overjoyed, I see just another pile of white-collar manure and nothing to shout about. Fun with Numbers #4: Lastly, the spending on Goods—the backbone of a health, growing economy—declined by 27 bps. In a related news, the November durable goods report showed a -0.7% drop in spending, quite the opposite of the positive number that Wall Street was expecting. The reaction of the bond market to the 5% number. Bonds should have softened in the face of such strong economic numbers, but the “adults” (the bond traders) on Wall Street saw the same manure that I did. If the economy was as healthy as the BEA wants us to believe, the “patience” and “considerable time” promise of the FOMC should soon be broken… right? I spend most of the year in Asia, including China, and I am seeing the same level of numbers massaging by our government as China’s. In China, the government leaders establish statistical goals and the government bean counters find creative ways to tweak the data to achieve those goals. That’s the financially dangerous world we live in, and I hope that you have some type of strategy in place to deal with the bursting of what’s becoming a very big, debt-fueled bubble. CAMBRIDGE – Indian Prime Minister Narendra Modi’s vigorous foreign policy in the seven months since he took office has surprised observers. After inviting the leaders of Pakistan and other neighboring countries to his inauguration, he embarked on trips to China, Australia, and the United States. More recently, he welcomed Russian President Vladimir Putin to New Delhi and signed a large number of trade deals and orders to import Russian nuclear reactors. India, Modi is telling his fellow citizens, is strong and well regarded around the world. Next month, US President Barack Obama will travel to New Delhi as Modi’s special guest at events commemorating Republic Day, India’s national holiday – just three months after the two leaders held substantive talks in Washington, DC. The visit should thus be regarded as a clear signal of Obama’s desire, no less than Modi’s, to strengthen US-India relations. So what is likely to be on Obama’s mind when he meets his Indian counterpart again, and what does he think can be done to cement bilateral ties? Three issues stand out – beginning with trade, which is as important politically as it is economically. Obama hopes that the Trans-Pacific Partnership will be concluded in 2015 and ratified by the US Senate. The TPP will not be as powerful a free-trade agreement as originally intended, owing to exclusions and a very long phase-in period. But it will tie the US and 11 other Pacific Rim countries (including Japan but excluding China) together in a new economic bloc. Obama should be eager to stress that India’s exclusion from the TPP is a matter solely of geography – India does not abut the Pacific – and that the US wants to increase bilateral trade and direct investment by American firms. The second issue is terrorism. The US authorities are worried that American citizens who have been fighting with the Islamic State and Al Qaeda in the Middle East will return home to commit terrorist acts. India has experienced horrific acts of terrorism on its own territory. Continued cooperation between the US and Indian intelligence agencies can help both countries prevent future incidents. Terrorism includes not just physical violence, but also assaults in cyberspace. China, Russia, and Iran have been the source of frequent cyber attacks on banks, companies, and government agencies; North Korea, the US alleges, was behind the recent breach of Sony Pictures’ computers. Though Obama presented evidence to Chinese President Xi Jinping of technology theft by hackers based in China, the Chinese authorities continue to deny it. More recently, Russia and others have been planting malware in the control systems of the US power grid and other sensitive networks. Looking ahead, the US worries about cyber attacks by non-state actors like the Islamic State and Al Qaeda. Although these groups’ members may lack the sophistication to commit such acts, they may try to hire individuals with the necessary skills. India has a large number of talented computer engineers, including some who might be sympathetic to the Islamist cause. The US and India could both benefit from cooperating to prevent and disrupt such recruitment efforts. The third issue on Obama’s mind is bound to be China’s asserted goal of dominating Asia and excluding the US from the region. Chinese hegemonic ambition runs counter to India’s strategic interests as well – reason enough for Modi’s eagerness to strengthen his country’s relations with its neighbors as well as with the US. Obama has already made it clear that the US understands that Modi’s willingness to cooperate with Russia, despite Western sanctions imposed on the country, stems from India’s desire to discourage a Sino-Russian alliance against it. Modi won a landslide victory in an election that reflected the Indian public’s disappointment with the policies and performance of the previous government, led by the Indian National Congress. Though India had experienced annual real GDP growth of more than 8% for several years, growth has slowed since 2010, to less than 5% in 2013, owing to a populist shift in policies dictated by Congress party leader Sonia Gandhi. By contrast, the Modi government plans to pursue a pro-growth agenda that includes reducing bureaucratic delays, increasing infrastructure investment, stimulating manufacturing activity, and shifting to a simpler unified tax system. Modi’s agenda also evidently includes an active foreign policy – as it should. Cultivating India as a reliable partner in the global economy and in international affairs is a high priority for the US as well. Obama’s visit to India can help to realize that relationship’s potential. Halfway down a muddy, secluded road on marshland in suburban Essex sits Wharf Pool, a lake stocked with some of the biggest freshwater fish you will ever see. A white sign with red lettering reads: “Private Syndicate: Strictly Members Only.” A metal gate, a barbed-wire fence and two CCTV cameras bar the way. Anglers hoping to spend time on the lake’s carefully tended banks must join a waiting list. Those who make it to the top pay a membership fee that buys them the chance to catch a carp that weighs more than a Jack Russell. There are hundreds of them swimming beneath the surface. It’s close to shooting fish in a barrel. Traders at BP haven’t been accused of any wrongdoing. Last year, within hours of regulators announcing probes, the chats between BP and the banks were shut down, people with knowledge of the matter said. Soon after, a compliance officer was placed on the desk for the first time, one of them said. BP said in a statement that it conducted an internal review after regulators began probing currency markets. Usher declined to comment through his lawyer. White directed calls to BP’s press office. As a company with global operations, BP is a major user of the $5.3-trillion-a-day foreign-exchange market. Dollars earned from the sale of crude oil are converted into local currencies to pay the salaries of employees and fund infrastructure projects from Azerbaijan to Trinidad. Refined products such as liquefied natural gas and kerosene are sold for yuan and reais. The trading unit’s primary role is to manage the firm’s exposure to financial risks, including fluctuations in interest rates and foreign exchange, according to the company’s website. Unlike at most corporations, it also is run as a profit center, which means that in addition to hedging risks, traders can place their own bets on the direction of markets. The company doesn’t break out how much money the treasury unit makes. White, who’s known in the market as Tubby, is one of half a dozen spot currency traders working for BP in London. He and his colleagues, most of them ex-bankers, decide which firms will carry out their foreign-exchange transactions. That makes them prized clients for banks seeking a slice of the business and a glimpse into potentially market-moving trades. Passing on information was a way to curry favor, according to the four traders, who asked not to be identified because they still work in the business. The Cartel chat room was started by Usher as early as 2009, according to a person with knowledge of the matter. Usher had risen quickly to the top of his profession. After joining HBOS Plc in 2001, he was hired by Royal Bank of Scotland Group Plc in 2003 and a year later collected an industry award on his employer’s behalf. He joined JPMorgan as head of spot foreign exchange in 2010, where he became a member of the now-defunct Bank of England’s Chief Dealers Sub Group, a collection of about a dozen currency traders and central bank officials who met at restaurants and bank offices to discuss industry developments. The four members of the chat room ribbed each other like high school buddies. Usher was referred to as Feston because he resembled an overweight version of British chef Heston Blumenthal, according to people who have seen the chats. Matt Gardiner, a UBS trader based in Zurich, was called Fossil because he was a few years older than the others. Rohan Ramchandani, Citigroup’s cricket-loving head of spot trading, was called Ruggy, while Chris Ashton, the last one to join, was dubbed Robocop. Lawyers for Ramchandani, Gardiner and Ashton declined to comment. The settlements the banks reached with regulators reveal that in the minutes before 4 p.m. the traders would meet on chat rooms to discuss their positions and how they planned to execute them. The party came to an end in October 2013, when regulators around the world announced they were investigating allegations of abuses in the currency market. The four members of the Cartel have left their firms, and JPMorgan, Citigroup and UBS were among banks fined in November. Individuals could face criminal charges when the U.S. Department of Justice and the U.K.’s Serious Fraud Office conclude their own investigations.